This is a guide on how to build components. On the Lazarus IDE menu, click Package > New Package to run the Package Manager. A Save file dialog will appear. Chose a folder and a file name and press save. If the IDE prompts for using lowercase filenames press 'yes'. Congratulations: You have just created your first package! You can create a new unit or use an existing file. Both options are described below. Use the Add button > New component. Choose a component like TComboBox. 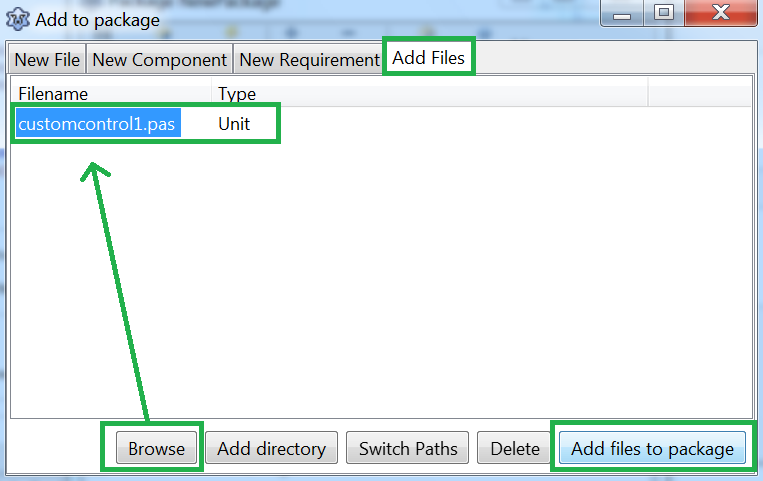 Choose customcontrol1.pas as Unit File Name and CustomControl1 as Unit Name. You can now give to the component a icon and determine on which palette the component should appear later in the Lazarus-IDE. Now add the code for your component. Resist the temptation to install the new component into the IDE at this early stage. It is very likely that the new component is still buggy. Since the new component will become a part of the IDE it can crash the IDE, it may even be possible that the IDE does not start any more. Test your component excessively. Now the IDE will ask you, if the IDE should be rebuilt. Say yes. Lazarus automatically restarts and you can see your new component in the component palette. Congratulations: you have just installed your first package with your first package component. Note: If you do not see your new component in the component palette, it is most likely that you are not running the re-compiled version of Lazarus. You can set where Lazarus builds to using Tools -> Options -> Files -> Lazarus directory. Instead of calling Lazarus directly, you also can use startlazarus, which starts the newly created Lazarus, for example the Lazarus executable in the ~/.lazarus directory, if you don't have write access to the directory Lazarus was installed into. Note: If things go wrong because the new component is still buggy and Lazarus cannot be started again you delete the new lazarus.exe and rename the backup copy of the previous version, lazarus.old.exe, back to lazarus.exe. Click the Add button, go to the Add Files tab. At the Unit file name, browse to your existing file. Click Add files to package. If the package manager complains that the unit is not in the unit path, click yes to add the directory to the unit path. Click the Add button again, go to the Add Files tab, browse to the .lrs file and click OK (See Step 3 about creating this icon file). Click the Add button again, go to the New Requirement tab. In the Package name select LCL and click OK.
Click under the Files tree in the Package Manager. In the File Properties, make sure Register unit is checked. Click the Options button. 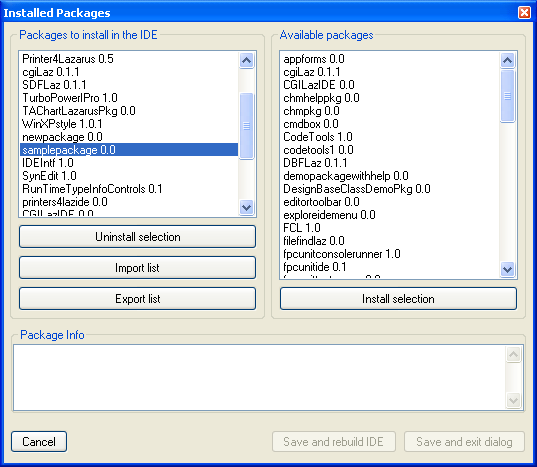 Select the IDE Integration tab. In Package Type, make sure Designtime and Runtime is selected. Click the Compile button to check to see that the files compile without errors. Click the Install button. Lazarus will rebuild and restart automatically. You should create 24x24 pixel size PNG files as icons. If, for Lazarus 1.8+, you want the palette icons to scale at higher screen resolutions you should also provide 36x36 and 48x48 pixel icons. The names of the larger icons require an appended '_150' and '_200' to the filename, repectively ('_150' for 150%, '_200' for 200%). You can use Lazarus Image Editor to create the icons in .lrs format. lazres is usually located in the Lazarus tools directory. You may need to compile lazres at first use. Simply open the lazres.lpi in the IDE and click run > build in the menu. TMyCom is the name of your component! The name of the image must match the name of your component! Following is a sample of the resulting samplepackage.lrs file. GLazRes is the graphical version of lazres that can assemble files into a Lazarus resource file (.lrs). It can be found in the tools directory of a Lazarus installation. You need to rebuild the package every time you make changes to the mycom.pas file. 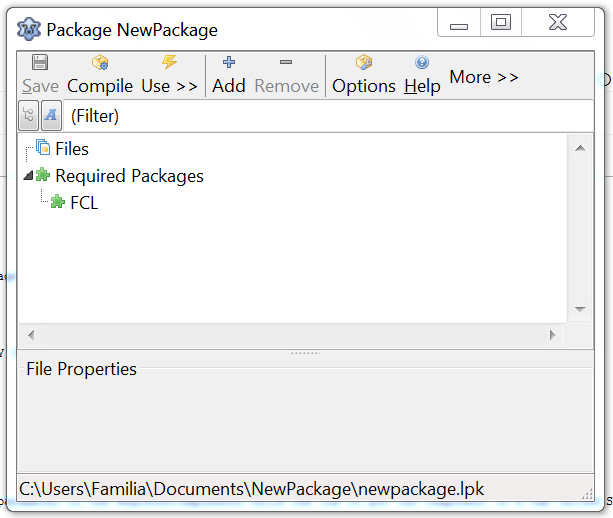 To rebuild the package, open the samplepackage.lpk file in the Package Manager and click the Install button. 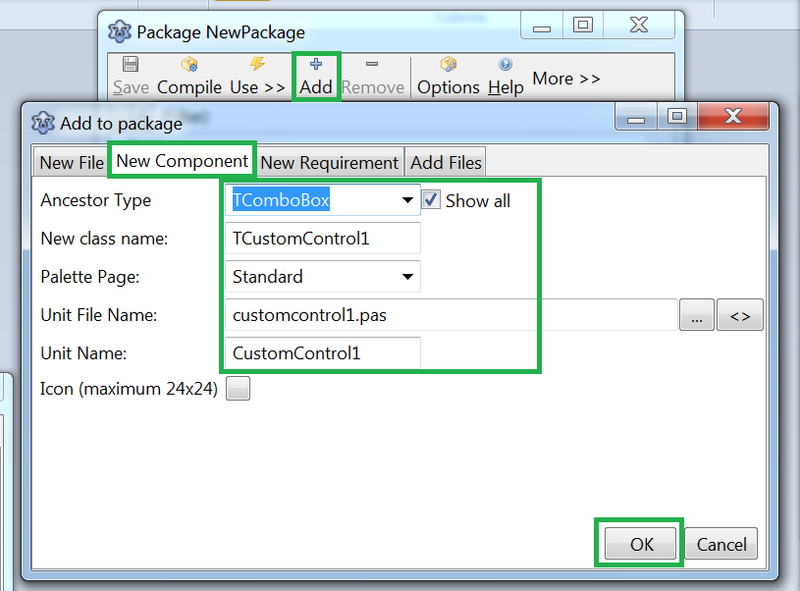 To remove installed components: on the IDE menu, click Package > Configure installed packages. 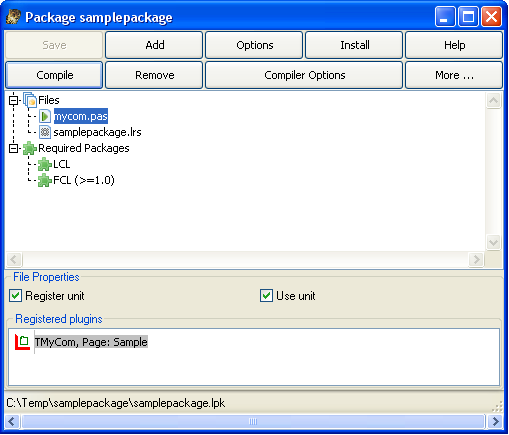 The following image shows the Installed Packages tool. Select the package you want to uninstall and click Uninstall selection. If something goes wrong with a package (e.g. 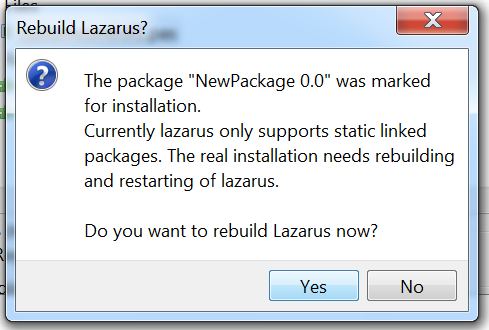 package directory is deleted without first uninstalling it), Lazarus may not allow you to uninstall packages. To fix the problem, at the IDE menu click Tools > Build Lazarus. Lazarus will rebuild all packages and restart. You should now be able to uninstall problematic packages. The code in mycom.pas above gives you the basics on what you need to create a component. The following is an enhanced version with some tips on how to write procedures and events for components. MyText and MyText2 shows different ways to write properties. You can use TComboBox instead of TCustomComboBox as the base class, which publishes all properties as TComboBox. If TCustomComboBox is used as the base class, you'll notice a lot of properties and events will be missing in the IDE Object Inspector. To add those properties and events, just copy and paste the properties as listed below // properties from TComboBox. These list of properties can be got from the TComboBox declaration in the StdCtrls unit. Omit any property which you want to handle yourself. It's possible to use standard components embedded in your own components (look for example at TLabeledEdit or TButtonPanel). Add a private attribute for the label component (FEmbeddedLabel: TLabel;). If the component to be embedded is not a 'subcomponent' by default (like TBoundLabel, TPanelBitBtn etc) then add the call to SetSubComponent. This is necessary for the IDE so it knows that it has to store the properties of the embedded component as well. TLabel is not a subcomponent by default so the call to the method must be added (FEmbeddedLabel.SetSubComponent(true);). Now you can create a MyLabel inside your program, at run time, with that overridden Paint procedure instead of the standard one. However, inherited behavior is not desirable in this case, since the second writing action would overlap the first (inherited) one. Property editors provide custom dialogs to edit properties in the object inspector. For most properties, like strings, string lists, images, enumerated types and others, there are already default property editors, but if a custom component has a special kind of property it may require a custom dialog to edit the property. Each property editor is a class, which should descend from TPropertyEditor or one of its descendents and implement methods from this base class. They should be registered in the 'Register' procedure by using the function RegisterPropertyEditor from the unit PropEdits. It is a standard to name property editors with the property name followed by 'Property', for example TFieldProperty for the property editor of the TField property. A good example for a property editor is the TFont property editor. One of the most common cases for property editors is properties which are classes. Because classes have many fields and can have a variety of formats, it's not possible for Lazarus to have the object inspector edit field able to edit it, like is done for strings and numeric types. Component editors control the behavior of right-clicking and double clicking components in the form designer. The most important method of a component editor is Edit, which is called when the component is double clicked. When the context menu for the component is invoked the GetVerbCount and GetVerb methods are called to build the menu. If one of the verbs (which means menu items in this case) are selected, ExecuteVerb is called. There is a default component editor (TDefaultEditor) which implements Edit to search the properties of the component for the most appropriate one to be edited. It usually chooses an event, which is edited by adding it's skeleton code in the code editor and setting the cursor to be in place to add code for it. Copy - Called when the component is being copied to the clipboard. The component data for use by Lazarus will always be added and cannot be modified. This method is instead for adding a different kind of clipboard information to paste the component in other applications, but which won't affect the Lazarus paste. This page was last modified on 12 April 2019, at 18:00. This page has been accessed 44,466 times.